It’s a good time to be Tyler, the Creator. 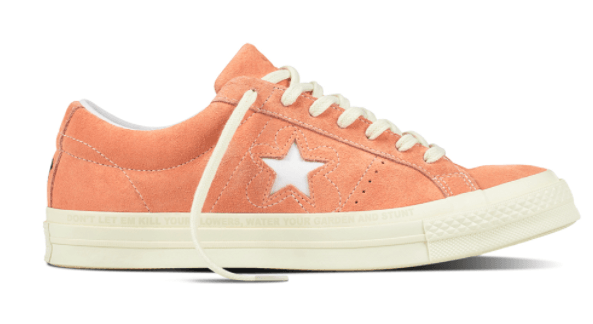 Fresh off the back of releasing one of the year’s best records with Flower Boy, the rapper and designer has also been busy sharing the fruits of his partnership with Converse. 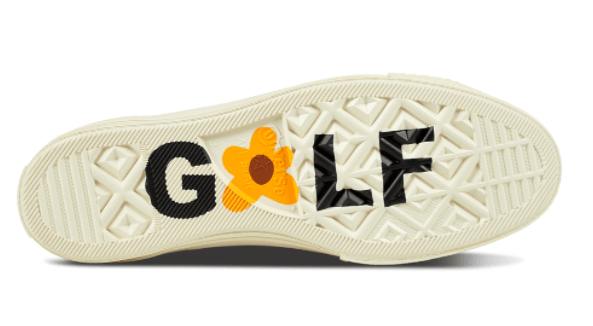 The latest chapter in their collaborative relationship sees the release of the One Star x Golf le Fleur collection, a line which features the iconic trainer in four different colourways, alongside accompanying apparel. Available in Airway Blue, Peach Pearl, Sulphur, and Fuschia Glow – with an interchangeable set of tonal laces – the shoe comes with inscriptions from Tyler on both the inner and outer sole: “Don’t let ‘em kill your flowers, water your garden and stunt.” The clothing drop includes Converse Essentials Pull-Over Hoodies and Tees featuring Golf le Fleur graphics.